Go forth into a world ravaged by dragons and plagued by undead with this motley crew of wandering adventurers! For use with the Dungeons & Dragons fantasy roleplaying game STARTER SET. The dwarf cleric, human ranger, halfling rogue, elf wizard, Northlands fighter, and elf druid represent some of the most iconic classes and races from the Dungeons & Dragons universe. 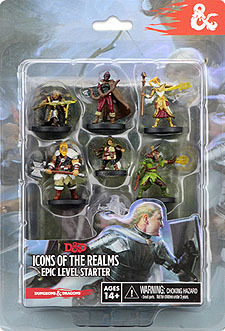 These high quality figures bring an exciting new depth to your D&D adventures. Also includes is a high quality paper map of your party's camp site to aid your Dungeon Master in crafting your quest. With this set of heroes you and your friends can explore, quest, and battle in epic realms of wonder.